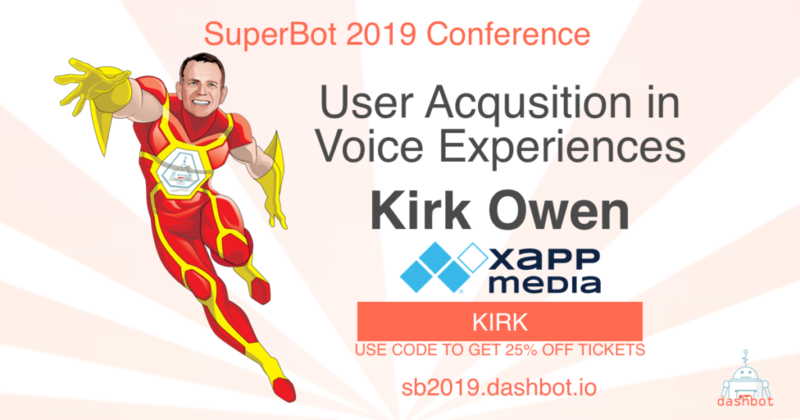 We’re thrilled to have Kirk Owen, VP of Business Development, joining us at SuperBot 2019 to share his insights on acquiring users in conversational AI and the larger tech space. Kirk is a senior media technology executive that has worked across voice, gaming, TV and online education to develop and sell engaging and innovative software products. Prior to joining XAPPmedia as the VP of Business Development, Kirk was a senior business development manager with Amazon Alexa where he worked with developers to bring gaming, finance and media voice apps to market. In his 18+ years in the games industry Kirk has worked in virtually every aspect and market segment to include voice, social, mobile, PC and console and across the industry value chain to include pre-production, production, design, usability testing, quality assurance, marketing, promotion, distribution, licensing, localization and porting. Additionally, Kirk has worked with major licensors from the world of film, television, music and books to include Paramount Studios, The Walt Disney Company, National Geographic and Simon and Schuster. While an executive producer at The Walt Disney Company, Kirk’s studio launched Purina Pet Resort, a game that to that point had the lowest customer acquisition cost of any title launched by his unit.